and Upscale Watches Since 1969. Quartz is king in the realm of timekeeping technology. About 95% of the watches produced today have quartz movements. What is a quartz movement, anyway, and how come quartz watches are so popular? Read on. Quartz is a crystalline mineral, silicon dioxide, that is found in abundance in the earth's crust and is the principal component of sand. The quartz used in watches is synthetic, or man-made. Watch manufacturers use synthetic quartz crystals rather than natural ones because they have more consistent properties. 2. What is a quartz watch? A quartz watch is one that measures time by means of a paper-thin piece of synthetic quartz. The quartz vibrates very quickly in response to an electric charge; it is these vibrations that enable the watch to keep time. Quartz watches have either an analog dial, with rotating hands, or a digital display, which shows the time with numbers. Most analog watches have quartz movements. All digital ones do. 3. Where does the electricity come from? In most quartz watches, it comes from a battery. Some quartz watches, however, get their electricity from a mini electrical generator incorporated into the watch movement. The generator is powered by the movement of the wearer's wrist, which causes a rotor to spin rapidly. These watches are sold by the Japanese company Seiko under the name "Kinetic" and by the Swiss manufacturer SMH under a variety of names including "Autoquartz" and "Omegamatic." Japan's Citizen Watch Co. supplies its own version of these watches- called Mecaquartz- through its private-label division. Still other quartz watches get their electricity from light. The light is transformed into electrical power by a solar cell underneath the watch dial and stored in a capacitor. Citizen sells light-powered watches under the "Eco-Drive" label, while Seiko's Pulsar brand markets theirs under the name "Pulsar Solar." 4. How does a quartz watch work? The tiny piece of quartz serves as the watch's "oscillator." All timepieces have an oscillator of some sort- an object which, through its continuous, unvarying motions, "tells" a watch or clock how much time has passed. The oscillator in a grandfather clock, for instance, is a pendulum. II. As the quartz oscillates, it sends electrical pulses- at the same rate of 32,768 per second- back to the integrated circuit. A device called a "trimmer" regulates the quartz oscillations. III. The IC "divides the electrical pulses repeatedly until they have been reduced to a single pulse each second. The circuit is, in effect, counting the pulses and returning to zero each time the count hits 32,768. IV. If the watch is an analog model, the one-second impulses are transmitted to a stepping motor, which transforms them into mechanical pulses that drive a chain of gears and, ultimately, the watch hands. If it's a digital watch, the integrated circuit continues counting pulses as they add up to minutes, hours, and if the watch has a calendar display, days. In a digital watch the IC also provides the power to the display and contains the watch's setting functions. Because a digital watch has no gears or other moving parts, its construction is called "solid state." 5. How is a quartz watch different from a mechanical watch? It's different in two ways. First, a mechanical watch has a different type of oscillator than a quartz watch. The oscillator in a mechanical watch is a tiny wheel moving back and forth very quickly, called a "balance wheel." Second, a mechanical watch has a different power source than a quartz watch. A mechanical watch gets its power from the gradual unwinding of a spring, called a "mainspring." The wearer winds the spring using the crown on the side of the watch. A quartz watch, as we've seen, is powered by electricity. 6. Do quartz watches offer advantages over mechanical ones? Yes, quartz technology offers several advantages. First, quartz watches are much more accurate than mechanical ones. That's because the oscillator of a quartz watch, the little piece of quartz, is a much steadier oscillator than the balance wheel of a mechanical watch. It's a basic rule of timekeeping that the steadier an oscillator, the more accurate the timepiece. Decent-quality quartz watches generally gain or lose no more than a minute or two a year. Because they're so accurate, quartz watches can time extremely short periods of time. Some have subdials or digital displays that record 10th of a second. Another advantage of a quartz watch is that, unlike a mechanical watch, which has a mainspring, a quartz watch needs no winding. A third benefit of quartz is that quartz movements can be made thinner than mechanical ones. Some quartz movements are thinner that 1 millimeter. Slimmer movements enable companies to produce sleek, streamlined watches. Fourth, quartz watches don't need as much maintenance as mechanical ones. The latter require regular cleaning and oiling, which can be a time consuming and expensive process. With a quartz watch, an inexpensive, while-you-wait battery change is all you need. Fifth, the electronic circuitry in quartz watches enables them to perform amazing feats that would be impossible with a mechanical watch. Some multifunction quartz watches can store information such as telephone numbers or the different times a runner takes to run the laps in a race. Some can also do arithmetic. 7. If quartz is so great, why do companies still make mechanical watches? They make them because many consumers value the craftsmanship required to create a mechanical movement and are willing to pay a great deal of money for it. And because the vast majority of watches made today are quartz models, many people believe that wearing a fine mechanical watch sets them apart from the crowd. The mechanical watch has become a status symbol. 8. Are all quartz watches equally accurate? No. Some quartz watches are better than others- their gear trains operate more smoothly, for example, or they are more resistant to shock. Factors like these affect the watches' accuracy. 9. How can I tell if a watch is quartz or mechanical? There are a few rules and clues to remember. First, as noted above, all digital watches are quartz watches, and so are nearly all women's watches (see question 13). With men's analog watches there are various ways to tell quartz from mechanical. Many mechanical watches that have automatic, or self-winding" movements, are labeled "automatic" on the face. (Quartz watches are only seldom labeled as such.) Many mechanical watches also have see-through dials or case fronts to show off their movements. Quartz watches almost never do. If the watch has a seconds hand, you can tell quartz from mechanical by watching the hand for a moment. The seconds hand of a quartz watch moves in a jerking motion, jumping forward in one-second intervals. The seconds hand of a mechanical watch moves in a smooth arc. 10. When were quartz watches invented? 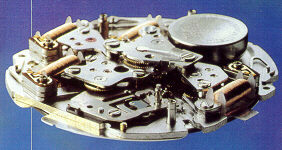 The first quartz watch movements were made in the late 1960's by a consortium of Swiss watch companies. After completing their prototypes, however, these companies decided not to pursue quartz technology any further. They realized that to switch from making mechanical watches to making quartz ones would require a complete revamping of their factories and throw thousands of watchmakers out of work. One Japanese firm saw things differently, In 1969, Seiko became the first company to offer a quartz watch to consumers. 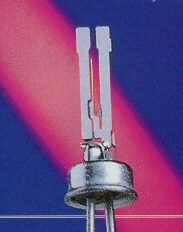 It was an analog model, the Astron 35SQ. 11. Who makes quartz watches now? Nearly all watch companies in the world make quartz watches. Most quartz movements are made by one of three companies: the Japanese firms Seiko and Citizen- Citizen is the worlds biggest producer of quartz watches and movements- or the Swiss movements-maker ETA. 12. Are quartz movements the most accurate timekeepers there are? No. One type of timekeeper, the atomic clock, is more accurate than a quartz timekeeper. Atomic clocks use as their time base the absorption or emission of electromagnetic radiation by atoms or molecules. The rate of this absorption or emission is extremely steady- even steadier than the oscillations of a quartz crystal. It's interesting to note that quartz crystals play an essential role in atomic timekeeping- even though they don't provide its time base. The frequency of atomic oscillations is too high for them to be used to control a clock directly. Instead, the oscillations of a quartz crystal are multiplied and "compared" with the atomic oscillator. The quartz oscillations are adjusted periodically to keep them accurate, and it is these oscillations that actually drive the clock. 13. Why are nearly all women's watches quartz-powered? Watch companies have found that women are less interested in the mechanics of a watch than in its styling. Since quartz movements are less expensive, more accurate and don't need winding, women tend to prefer them. That's why Patek Philippe, for example, uses quartz movements in nearly all of its women's watches but mechanical ones in most of its men's watches. Furthermore, companies have found that women who want the cachet of a mechanical watch prefer men's models because they're larger and often easier to identify by brand than women's watches. The Swiss company Breitling, for example, sells many men's watches to fashionable, status-conscious women.